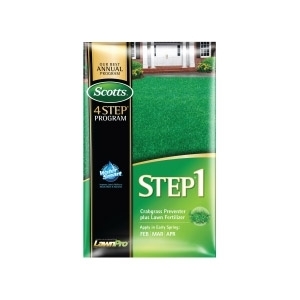 • Scotts® Lawn Pro® Step 1 Crabgrass Preventer Plus Fertilizer: Prevents crabgrass and 8 other problem weeds. • Patented formula builds thick, green lawns from the roots up. • Scotts BEST Annual Program for a picture perfect lawn. • Apply in early spring: February-April. • Not for use on dichondra or bentgrass lawns.